In this pronunciation lesson you will learn how to pronounce the letter L in Brazilian Portuguese when it is at the end of a word or a syllable. Let me start with three very common words. You can find these words in the song Levada Brasileira, by Daniela Mercury. I will give you a tip: when I pronounce the final L of a word, I do not move my tong up. My tong does not touch the roof of my mouth as it does when I pronounce it in English. For English speakers, the ending of “Brasil” sounds like the word “few” as in a few people. Or you may find another word whose sound will help you remember how to pronounce this final L correctly. English speakers may think of the word “now” or “vow”. What word in your language can help you remember the sound of the letter L at the end of a word in Brazilian Portuguese? Check out out video lesson with Vocabulário de Futebol = Soccer Vocabulary! Notice that when the L is at the end of a syllable, the rule is the same as for the end of a word. I encourage you to learn with songs. 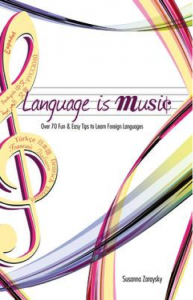 For great tips and strategies to learn language using music and other media resources, check out Susanna Zaraysky’s book Language is Music. It is available in English, Spanish, and Portuguese on Amazon.com.